What can be learned from the high-standards of passive building construction? The first question you may be asking yourself is what is passive building construction? We thought the same thing when a certified passive house consultant recommended that his client use PCA Screen Doors for their passive home. So we did a little homework and found it was a growing trend in new building construction that focused on building to a high energy efficiency standards. Passive buildings are today's highest energy standards that promise to slash the heating energy consumption of buildings by an amazing 90% because they don't have to apply the expensive "active" technologies like photovoltaics or solar thermal hot water systems. Superinsulation and air-tight construction minimize losses. When energy losses are minimized, long term savings are maximized. 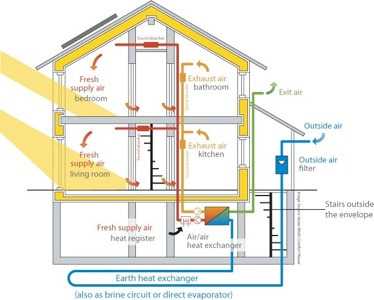 Knowing about thermal storage capacity of certain materials and their "passive" effects on the indoor temperature of a home, the certified passive house consultant (architect/designer) can plan for the energy efficiency of a house by specifying what products will work best according to the location's climate and seasons. Learn more about passive construction on the Passive House Institute's website. Could passive homes mean freedom from the storm door?! With a passive house, ugly and cumbersome storm doors are not needed. (Indeed, many upscale communities don't allow storm doors!). At the core of passive building design is that concept of controling the air flow, to cool or heat a home. A high quality screen door (that can be customized to the style of your home) allows homeowners to still let the fresh air in. Why do we care about passive energy efficiency? How could you not? Anything that can reduce energy consumption is a win-win. If you are a certified passive consultant or architect and need a high quality screen door to control air flow, contact us to learn more about PCA screen door products. Photo credits: Passive House Institute US. 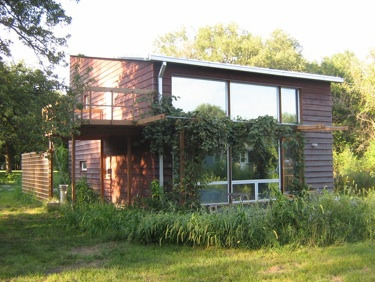 House featured is built to Passive House standard in Urbana, Illinois.